Michael The Researcher: George Washington's Birthday Today! Well, it is back to the birthdays on this blog. 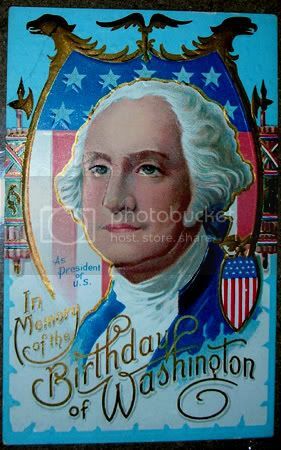 February 22 is the day of birth (on the Gregorian Calendar as opposed to the Julian Calendar used at the time) for General and first U.S. President George Washington. This is not to be confused with the crummy, watered-down version of Washington's Birthday included with all of the other Presidents (aka President's Day). In any event, here is a very nice postcard from circa 1909 to 1912 celebrating the day!